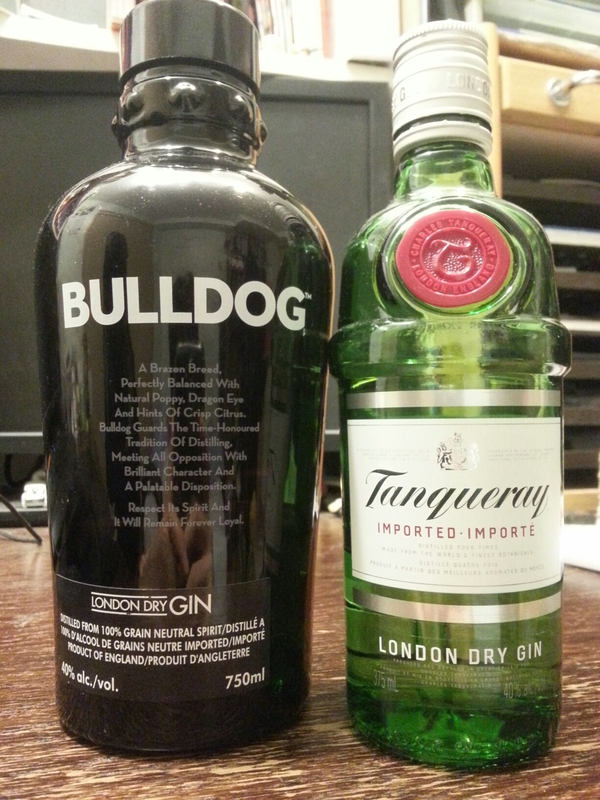 London Dry Gin Round 3 – Bulldog (Champ) VS Tanqueray (Challenger) | Justintoxicated. Welcome to Round 3 of the Gin battle! It’s been just over 2 years since I last compared or tasted Bulldog so I’m really looking forward to trying it again this duel. Up against our champ we have the heavy hitter Tanqueray, a globally well-known gin. 90-95 points rated by Paul Pacult, Wine Enthusiast Magazine; Restaurant Magazine’s 2008 Spirit of the Year. recipe contains at least: Tuscan juniper, angelica root, coriander, and licorice. Nose: The initial whiff of Bulldog is actually too aggressive and offensively burning. Subsequent nosings reveal fruity juniper and florals but still a lot of sharp nasal burn. Tanqueray: did I just pour water in my glass? Where’s the alcohol? Incredibly mute until you really stick your nose in there, light juniper and mild nasal tingliness. Kind of a toss-up, flavour or smoothness – depends on what you want. Me, I want something because I’m drinking a gin, not vodka. My preference is Bulldog. Taste & Texture: I get medium thick, initially sweet and then fruity longan-juniper with a lemon bite. Also a there’s a peppery finish. Good depth of flavour, heat control and elegance exhibited. Tanquery on the other hand, drinks watery, sweeter, juniper with bursting lemony citrus, all the while accompanied by alcohol burn and tingliness from the mids to the flat finish. Nowhere near as graceful nor smooth. Bulldog has my vote. Bulldog has distinct one-shot composure from start to finish: mellow entry, juniper to sweet longan transition, rounded floral finish. Very sippable. I’d likely stock Beefeater over Tanqueray if want a citrusy gin. I’ll have to do a proper head-to-head to find out for sure.